I have rescued a plant at work, but I don't know what it is. Some of the leaves were yellow when I got it, but the rest seem almost okay if fairly droopy. New leaves have started coming through, but despite regular watering, they seem to be drying out. It was on a cold windowledge when I got it, and now it's on an occasionally warm floor. How do I keep it alive? Hi Tasha, my first thought would be Dieffenbachia, are the leaves quite soft? possibly D. picta 'Exotica', or D. bausei. common name - the dumb cain, - and a very good reason for this! highly toxic, and the leaves/sap can cause a nasty rash. still a very worth while plant, but needs to be kept well away from young children and animals. also it is advisable to wear gloves when handling. now for how to care for it. my first thought is that looking at this pic, needs to be repotted, best time to do this is spring, so for now i would top dress with some fresh compost and pot up in to a larger pot in spring. they like humidity, so misting on the leaves is good, average warmth, with plenty of sun in winter, and partail shade in the summer. the worst thing you can do is overwater, little but often is the key through out the summer, water very sparingly in winter. hope this helps, and good luck. 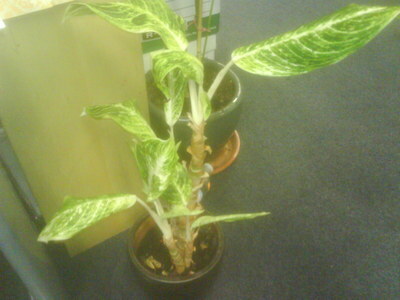 HI Tasha, its a Dieffenbachia thats been stuck in the office to long! Hi Tasha - yes, Dieffenbachia I think but not a very well chap! Be a little careful, as Majeekahead says - A good looking foliage plant when in better health, though.